In 2015 we were just two ordinary supporters, a Sons fan and a Jags fan who were concerned that real fans did not have an independent voice. 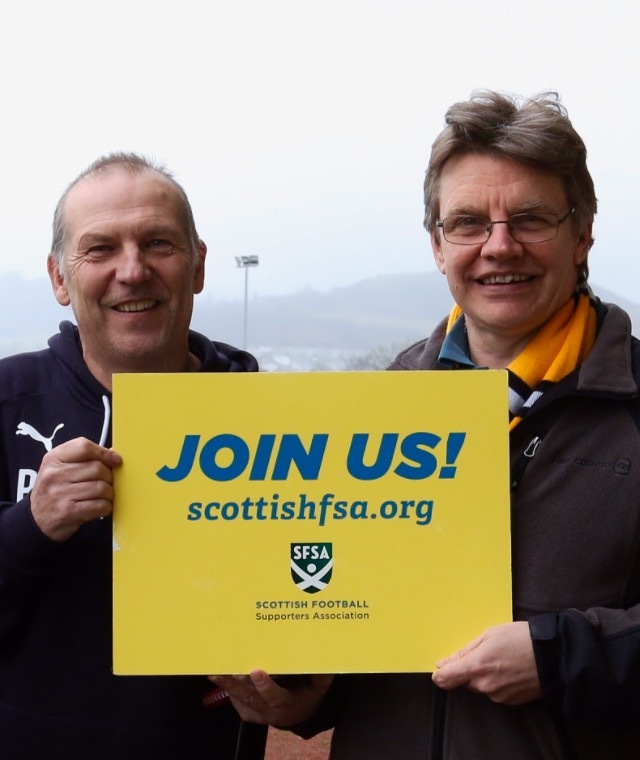 With the help of many others, we co- founded the Scottish Football Supporters Association. We decided to follow the successful model of the Football Supporters Federation in England. We have now grown to having nearly 71,000 members and we always believed that it was essential that just as the players, managers and coaches have a union so too should Scotland’s football supporters. Now we have fans from just about every club, large and small across Scotland and fans from across the World as members too. At long last we are able to represent their views to the media, to the Scottish Government and of course to the football authorities. As the organisation has grown there has been so many willing helpers contributing to make the SFSA bigger and better. All this has been achieved by many hours of work by a team of volunteers. We just wanted to take stock and to thank everyone who has contributed over the past few years. We will be announcing a range of new initiatives and sponsorships in the coming weeks none of which we could have done without the support of the many thousands of fans who now back us. So we just wanted to say thank you and that we appreciate your support.